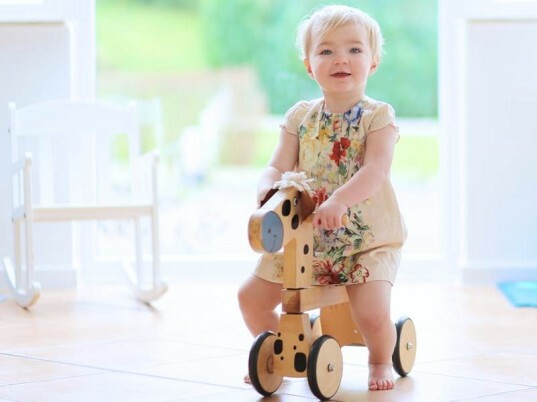 You may buy eco-friendly toys, serve healthy organic food and take your kids into nature, but if you ignore safe eco-minded cleaning, you could be creating a harmful home environment. If your goal is to live in a more sustainable manner, you should stick with non-toxic cleaners, preferably homemade because frankly, you can't always trust store-bought, so called "green cleaners." Not only are there huge dangers and safety concerns associated with conventional cleaners, but homemade eco-minded cleaners cost less and they're easier to concoct than you might think. Still, many parents who live in wet areas may be wondering about mold. Mold is serious business, so you clearly don't want it in your home. But you don't want to use toxic mold cleaners either, right? Keep reading to learn more about household mold and how to get rid of it with non-toxic cleaners that we'll give you the recipes for! At best, mold in your home is really gross. At worst, exposure to damp and moldy environments can cause a slew of harmful symptoms in you and your kids, such as nasal stuffiness, throat irritation, coughing, eye irritation, or, in some cases, skin irritation. The Institute of Medicine (IOM) has linked indoor exposure to mold to upper respiratory tract symptoms, cough, and wheezing in otherwise healthy people, not to mention shortness of breath, respiratory illness, and the potential development of asthma. The Centers for Disease Control and Prevention (CDC) notes that people with mold allergies, people with existing asthma, pregnant women, infants, the elderly and individuals with compromised immune systems are at higher risk for health problems from mold. Mold is not a laughing matter, especially if you’re pregnant or have young children in your home. If you’ve got mold, it’s very important to nip the issue in the bud. RELATED | 5 Homemade Cleaners Fresh from Your Kitchen Pantry – And the Best Ways to Use Them! Who Needs to be Mold-aware? Almost everyone needs to be aware of mold dangers, but some more than others. If your home floods for some reason, even just your basement, you need to be aware of mold. Although mold can appear in any area of the world, if your family lives in a fairly continually wet area, such as good old Portland, Oregon, Northern California or near a beach, your house is going to be naturally more prone to developing mold. Mold doesn’t just show up on walls either. Because there’s both indoor and outdoor mold, mold has been known to enter homes through open doorways, windows, vents, and heating and air conditioning systems. Mold has even been known to attach itself to clothing, shoes, bags, and pets and then it’s carried indoors. The CDC says that inside mold is most likely to grow in or near places with a lot of moisture, such as around leaks in roofs, windows, or pipes, or where there has been flooding. Mold grows well on paper products, cardboard, ceiling tiles, and wood products. Mold can also grow in dust, paints, wallpaper, insulation, drywall, carpet, fabric, and upholstery. Be aware too that mold can be many different colors and if you have a serious mold problem, you may not see it, but you WILL smell it – it’ll be a mildew-like, old, musty, wet scent. Control the humidity levels in your home. When you see a roof, window or pipe leak fix it immediately. Clean and dry any area that floods right away. Ventilate your laundry and kitchen areas where water and steam are likely. 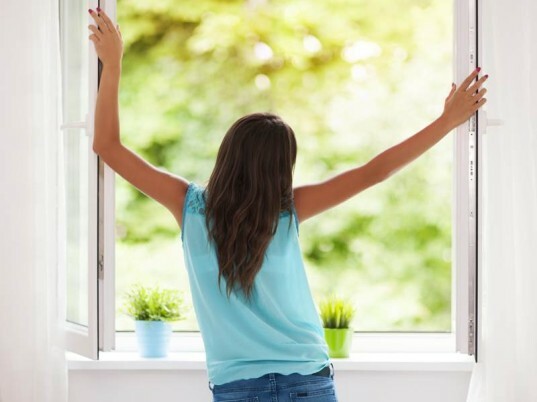 Open up your windows often to get fresh air and to air out your home. Stay on top of cleaning, especially making sure to wipe down walls once a week if you live in a mold-prone area. Don’t place furniture right up against the wall. Be sure to frequently wipe down hidden areas where mold may hide, such as under cupboards. If you think there’s mold on an object, such as carpet, books, clothing, stuffed toys or other fabrics, you should toss these items so mold can’t spread. You might think you can wash mold out of fabrics, but experts note that washing won’t kill all the mold spores on fabric items. As noted above, prevention and frequent cleaning are key when it comes to mold prevention. Good old hot water mixed with a basic natural soap make efficient cleaners for walls, sinks, tubs, counters and more. Although hot water and soap won’t disinfect, they will kill many germs and keep your home clean and dust-free. If you want more powerful homemade cleaners, below are some common natural disinfectant ingredients. Tea tree oil disinfects and is naturally anti-fungal and antiviral. Also deodorizes. Lavender, lemon, clove, rosemary and cinnamon essential oils also have disinfectant qualities. Baking soda deodorizes and adds scouring power without being too abrasive for surfaces. White vinegar removes mildew. If you hate the smell of vinegar, add a few drops of essential oil. Borax is semi-controversial. Most health organizations say Borax is safe (it’s a naturally occurring material) however, some studies have found that it can be toxic to humans in high doses. Still, if you trust Borax, it’s a natural insecticide and anti-fungal. Fresh & dried herbs and organic essential oils – consult a good herbal book and essential oil book before using to learn which disinfect best and to learn which may cause allergic reactions. If your home is prone to mold, try using one of the homemade disinfectants below. 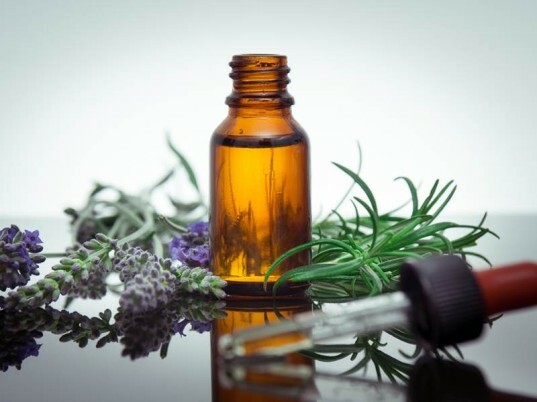 All purpose cleaner & disinfectant: In a bottle (be sure to label it) combine 3-5 drops of natural soap, 2 cups of water, and 15 drops each of tea tree and lavender essential oil. If you only have one of these essential oils, it’s fine, just use 30 drops of one. This cleaner is safe for almost all surfaces including cutting boards, counters, toilets, and walls. Don’t use on glass or fabric though as oils can cause streaking and stains. Herbal disinfectant cleaner: Gather a few handfuls of cleaning herbs such as lavender, eucalyptus, juniper, sage, thyme, or rosemary. You can use one or mix and match two or three herbs. Put herbs into a pot, cover with water (about 2-3 cups) and simmer the leaves and stems for 30 minutes. Strain your herbs, saving the liquid, which you should pour into a labeled spray bottle. If you want to cut grease on counters, add a few drops of biodegradable dish detergent to the bottle. If you’re cleaning often with hot water or one of the disinfectants mentioned above and scrub down places that might develop mold once in a while, you may be able to prevent mold altogether. If you see mold though, you may need to try a specific homemade cleaner. Quick mold and mildew spray: Fill a small spray bottle with two cups of water and 15 drops of pure tea tree essential oil. Once a week, spray down your walls with this solution and wipe dry. Grapefruit seed extract mold cleaner: Combine 20 drops grapefruit seed extract with 2 cups of water, mix well and spray on moldy areas. Don’t rinse. Let it sit for a while, then wipe or scrub off the mold. After removing the mold, respray the area and don’t wipe it off. 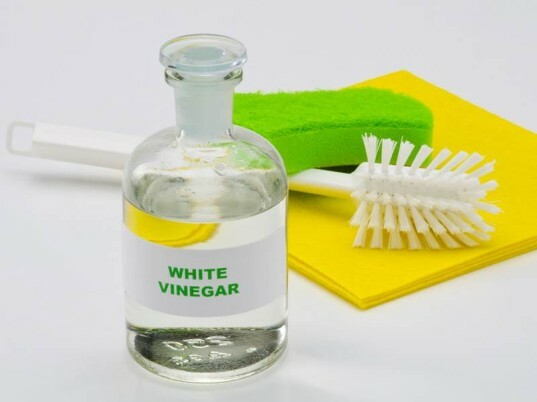 Vinegar: Some research has shown that plain old straight white vinegar will kill up to 80% or more of mold. Spray plain vinegar onto mold, let it soak then wipe and respray the area and allow the vinegar to dissipate, which can take a few hours. Borax: Combine 1/2 cup Borax with 1 gallon hot water and scrub down moldy areas. Isopropyl alcohol cleaner: Alcohol is a great disinfectant and cleaner, but not as safe as other cleaners. You’ve got to use this in a well ventilated area and wear gloves and eye protection. Sponge or spray alcohol on moldy areas, allow it to dry, then scrub down the area with hot water. What if Homemade Mold Cleaners Don’t Work? If you’ve got mold and no natural cleaner on earth is working, you’ve got to move on to harsher methods. Mainly because mold is highly toxic to humans. You can’t just allow a mold issue to sit and grow. At this point, using chemicals is safer than being exposed to mold. If you use bleach to clean up mold, only use about 1 and 1/2 cups worth of bleach per gallon of water. Spray or wipe the bleach mixture on the mold then use a stiff brush to scrub away mold. Afterwards rinse the wall with plain water. When using bleach, leave the windows open, wear gloves and protective eye wear. If mold or other commercial mold cleaners don’t seem to be working, you may have a serious mold issue. At this point you might consider calling a contractor in because your drywall may have been infected with mold. If you suspect that the heating/ventilation/air conditioning (HVAC) system is the cause of ongoing mold, you should consult Environmental Protection Agency’s (EPA) guide Should You Have the Air Ducts in Your Home Cleaned? before taking action, but don’t run the HVAC system in the meantime. For more mold information, visit the EPA. At best, mold in your home is really gross. 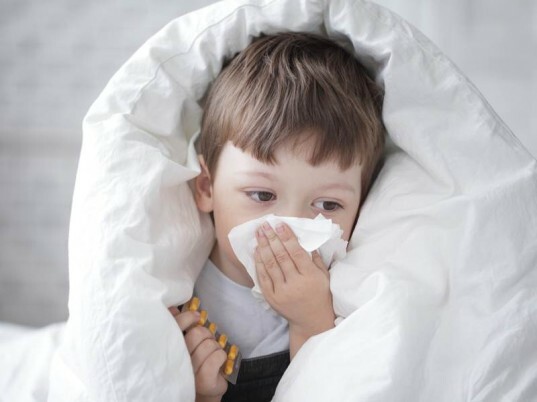 At worst, exposure to damp and moldy environments can cause a slew of harmful symptoms in you and your kids, such as nasal stuffiness, throat irritation, coughing, eye irritation, or, in some cases, skin irritation. The Institute of Medicine (IOM) has linked indoor exposure to mold to upper respiratory tract symptoms, cough, and wheezing in otherwise healthy people, not to mention shortness of breath, respiratory illness, and the potential development of asthma. 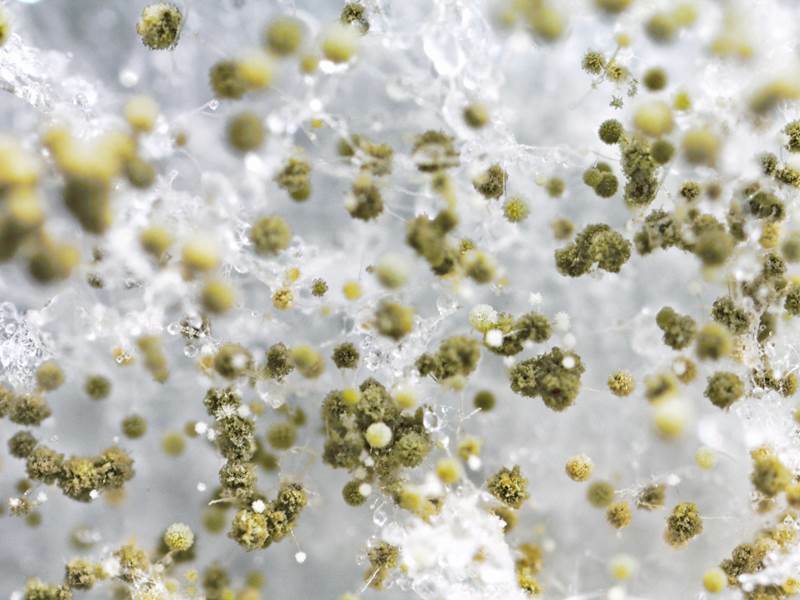 The Centers for Disease Control and Prevention (CDC) notes that people with mold allergies, people with existing asthma, pregnant women, infants, the elderly and individuals with compromised immune systems are at higher risk for health problems from mold. Mold is not a laughing matter, especially if you're pregnant or have young children in your home. If you've got mold, it's very important to nip the issue in the bud. Image via Shutterstock Who Needs to be Mold-aware? Almost everyone needs to be aware of mold dangers, but some more than others. If your home floods for some reason, even just your basement, you need to be aware of mold. Although mold can appear in any area of the world, if your family lives in a fairly continually wet area, such as good old Portland, Oregon, Northern California or near a beach, your house is going to be naturally more prone to developing mold. Mold doesn't just show up on walls either. Because there's both indoor and outdoor mold, mold has been known to enter homes through open doorways, windows, vents, and heating and air conditioning systems. Mold has even been known to attach itself to clothing, shoes, bags, and pets and then it's carried indoors. The CDC says that inside mold is most likely to grow in or near places with a lot of moisture, such as around leaks in roofs, windows, or pipes, or where there has been flooding. Mold grows well on paper products, cardboard, ceiling tiles, and wood products. Mold can also grow in dust, paints, wallpaper, insulation, drywall, carpet, fabric, and upholstery. Be aware too that mold can be many different colors and if you have a serious mold problem, you may not see it, but you WILL smell it - it'll be a mildew-like, old, musty, wet scent. Hands down, the very best, most effective, safest and most eco-friendly way to get rid of mold is to never let it develop in the first place. With a busy schedule, this can be easier said than done, but you should know that once very bad cases of mold develop, there are few ways to get rid of it other than toxic cleaners, such as bleach. Prevention means the following: Run the fan every single time when you take showers or baths Control the humidity levels in your home. When you see a roof, window or pipe leak fix it immediately. Clean and dry any area that floods right away. Ventilate your laundry and kitchen areas where water and steam are likely. Open up your windows often to get fresh air and to air out your home. Stay on top of cleaning, especially making sure to wipe down walls once a week if you live in a mold-prone area. Add mold inhibitors to paints before painting. Don't place furniture right up against the wall. Be sure to frequently wipe down hidden areas where mold may hide, such as under cupboards. If you think there's mold on an object, such as carpet, books, clothing, stuffed toys or other fabrics, you should toss these items so mold can't spread. You might think you can wash mold out of fabrics, but experts note that washing won't kill all the mold spores on fabric items. As noted above, prevention and frequent cleaning are key when it comes to mold prevention. Good old hot water mixed with a basic natural soap make efficient cleaners for walls, sinks, tubs, counters and more. Although hot water and soap won't disinfect, they will kill many germs and keep your home clean and dust-free. If you want more powerful homemade cleaners, below are some common natural disinfectant ingredients. Tea tree oil disinfects and is naturally anti-fungal and antiviral. Also deodorizes. Lavender, lemon, clove, rosemary and cinnamon essential oils also have disinfectant qualities. Baking soda deodorizes and adds scouring power without being too abrasive for surfaces. White vinegar removes mildew. If you hate the smell of vinegar, add a few drops of essential oil. Borax is semi-controversial. Most health organizations say Borax is safe (it's a naturally occurring material) however, some studies have found that it can be toxic to humans in high doses. Still, if you trust Borax, it's a natural insecticide and anti-fungal. Fresh & dried herbs and organic essential oils – consult a good herbal book and essential oil book before using to learn which disinfect best and to learn which may cause allergic reactions. If your home is prone to mold, try using one of the homemade disinfectants below. All purpose cleaner & disinfectant: In a bottle (be sure to label it) combine 3-5 drops of natural soap, 2 cups of water, and 15 drops each of tea tree and lavender essential oil. If you only have one of these essential oils, it's fine, just use 30 drops of one. This cleaner is safe for almost all surfaces including cutting boards, counters, toilets, and walls. Don't use on glass or fabric though as oils can cause streaking and stains. Herbal disinfectant cleaner: Gather a few handfuls of cleaning herbs such as lavender, eucalyptus, juniper, sage, thyme, or rosemary. You can use one or mix and match two or three herbs. Put herbs into a pot, cover with water (about 2-3 cups) and simmer the leaves and stems for 30 minutes. Strain your herbs, saving the liquid, which you should pour into a labeled spray bottle. If you want to cut grease on counters, add a few drops of biodegradable dish detergent to the bottle. 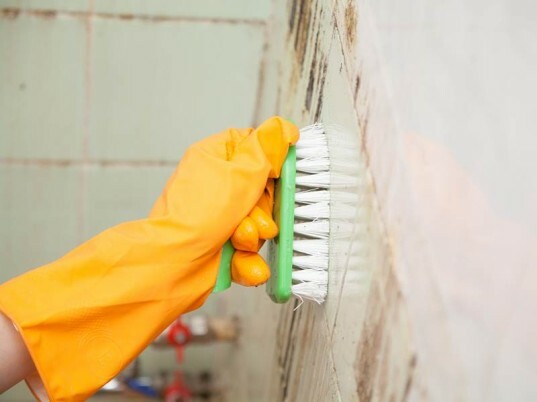 If you're cleaning often with hot water or one of the disinfectants mentioned above and scrub down places that might develop mold once in a while, you may be able to prevent mold altogether. If you see mold though, you may need to try a specific homemade cleaner. Quick mold and mildew spray: Fill a small spray bottle with two cups of water and 15 drops of pure tea tree essential oil. Once a week, spray down your walls with this solution and wipe dry. Grapefruit seed extract mold cleaner: Combine 20 drops grapefruit seed extract with 2 cups of water, mix well and spray on moldy areas. Don't rinse. Let it sit for a while, then wipe or scrub off the mold. After removing the mold, respray the area and don't wipe it off. Vinegar: Some research has shown that plain old straight white vinegar will kill up to 80% or more of mold. Spray plain vinegar onto mold, let it soak then wipe and respray the area and allow the vinegar to dissipate, which can take a few hours. Borax: Combine 1/2 cup Borax with 1 gallon hot water and scrub down moldy areas. Isopropyl alcohol cleaner: Alcohol is a great disinfectant and cleaner, but not as safe as other cleaners. You've got to use this in a well ventilated area and wear gloves and eye protection. Sponge or spray alcohol on moldy areas, allow it to dry, then scrub down the area with hot water. What if Homemade Mold Cleaners Don't Work? If you've got mold and no natural cleaner on earth is working, you've got to move on to harsher methods. Mainly because mold is highly toxic to humans. You can't just allow a mold issue to sit and grow. At this point, using chemicals is safer than being exposed to mold. If you use bleach to clean up mold, only use about 1 and 1/2 cups worth of bleach per gallon of water. Spray or wipe the bleach mixture on the mold then use a stiff brush to scrub away mold. Afterwards rinse the wall with plain water. When using bleach, leave the windows open, wear gloves and protective eye wear. If mold or other commercial mold cleaners don't seem to be working you may have a serious mold issue. At this point you might consider calling a contractor in because your drywall may have been infected with mold. If you suspect that the heating/ventilation/air conditioning (HVAC) system is the cause of ongoing mold, you should consult Environmental Protection Agency's (EPA) guide Should You Have the Air Ducts in Your Home Cleaned? before taking action, but don't run the HVAC system in the meantime. For more mold information, visit the EPA.